MTX, the digital delivery client, goes off and fetches a torrent. Specifically, it fetches this torrent. Fire up any BitTorrent client and roughly 1.8GB later you’ll have a file called mechwarrior4mercenaries.all.to.51.03.01.0017.mtx. You can try loading that into the MTX software via the file-menu, but frankly, that doesn’t seem to work at all. You can grab the MTX installer here (15.54MB). It hasn’t been tampered with, but don’t take my word for that. You should always do a scan for malware if you don’t know who you’re getting a file from. To make life easier you should install and run MTX at least once, just to let it set up a few key registry settings. If the Mektek Web-site is back up by the time you do, then you’ve also saved yourself a few steps. Instead, rename the file to a zip file (mechwarrior4mercenaries.all.to.51.03.01.0017.zip) and unpack it wherever the heck you want it to go. You’ll need an additional 2GB of space for that. Then go to the directory you installed to, and create a shortcut to MW4Mercs.exe (in the Base sub-folder). Why a shortcut rather than running it directly? I’ll get back to that in a second. Run it, let it get to the start screen where you have the option to create a profile. Go click on the [X] in the top right corner to exit the application. It’s now stored the first-run status and created some registry entries. If it hangs during the next step, at least that part is out of the way. Now run it again. When you click New Profile from the start screen, the application might hang. If it does, then kill the process, edit the shortcut and add /gosnovideo to the shortcut, and launch using that. See? I told you I’d get to that. Then start the application again, and create your profile. You should be able to exit and run without the option after that, but you know what to do if it hangs the same way again. And there you go. It’d be very nice to – you know – actually have a manual for the game, but the distribution doesn’t seem to include one. It might be on the Mektek Web-site, but that’s still down and there are some rumors circulating that suggest it may not come back. Beyond all of this you might have some additional problems that I’m not having with the release. Good luck with those, because my ability to do long-distance tech-support is pretty limited, so I’m not the person to ask. Should the Mektek Web-site actually come back online, well, hooray. Otherwise, you’ve done by hand what MTX is supposed to do automatically. Why does it ask for a CD on my system? As always, you should be extremely careful when registry editing so that you don’t break anything that you still want. Firstly let me say that I *never* post anything on advice sites, but since there are not any comments yet people need to know that this WORKS and is AWESOME. Thank you so much for putting on this helpful guide, good sir, and saving me a week of waiting for MTX to get their gears in line. ok.. now its showing theres a update to .00020 problem is that you have to do it one at a time..
Because you need to delete HKEY_LOCAL_MACHINESOFTWAREMicrosoftMicrosoft GamesMechWarrior MercenariesCDPath from the Windows registry. 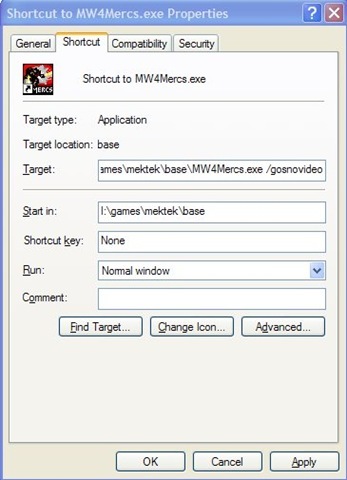 Apparently MTX installs this key if you let it install the game rather than doing it yourself manually. One of the later patches takes that registry key back out – or you can do it by hand. It all worked, ‘cept Norton identified MW4Mercs.exe as a virus. Hiya – thanks for the help… so far so good… I’ve got in-game but now what! Since I’m totally new to the franchise where do I find a manual? It might be enough to get you started, fingers crossed. Thanks for the quick reply – I guess there’s nothing like jumping in the deep end of the pool to learn how to swim. I’ll check out the link, but I guess if better options are discovered they’ll turn up eventually. I’ll keep my eye out. Since Mektek is down, I assume that would have been the first place to ask these questions… any good alternative fansites you know of? Half of the links from the original microsoft one are dead… or missing. The Mektek folks are having a pretty bad week overall. Thanks for this! I got my “free” copy on a PC PowerPlay magazine cover. Now I only take issue with their “No catch!” claim on the cover. The installer not working out of the box is a huge catch.